True Grit meets gold speculation in this YA western adventure. When hers father is murdered for a journal revealing the location of a hidden gold mine, eighteen-year-old Kate Thompson disguises herself as a boy and takes to the gritty plains looking for answers—and justice. What she finds are untrustworthy strangers, endless dust and heat, and a surprising band of allies, among them a young Apache girl and a pair of stubborn brothers who refuse to quit riding in her shadow. But as Kate gets closer to the secrets about her family, a startling truth becomes clear: some men will stop at nothing to get their hands on gold, and Kate’s quest for revenge may prove fatal. Vengeance Road starts with two horrible, violent murders. Kate Thompson finds the body of her father hanging from a tree, violently killed for reasons unknown and her house all but destroyed by fire. She vows revenge there and then and the second body that drops is the first one she kills. Disguised as a boy named Nate, Kate sets out to find the Rose Riders, a group of bandits that terrorise the west. During her quest, she will meet two young brothers who will become her friends, a young Apache girl who will be an ally and the truths behind her family’s story. Her journey ends in the gold mines of Superstition Mountains and in many ways that is also the starting point. It’s interesting that I approached the novel under the incorrect assumption that Vengeance Road was a work of speculative fiction? There I was expecting a novel with supernatural elements but soon it became clear this was something else altogether: a rare, straightforward Western. I love Westerns – and I really liked this novel. A revenge story featuring a strong-willed mixed-race girl out to avenge the death of her dear father, a heroine’s journey, a subtle, lovely, understated romance, a lot of violence and death, the gold rush, a YA novel that does not pull punches: Vengeance Road in a nutshell. I love Kate: stubborn, determined, willing to travel that vengeance road to the very end. This is where the “pull no punches” comes in and I will confess to have been pleasantly surprised by how Kate’s (and the narrative overall) journey is unapologetically violent and unrepentant. I rarely see female characters in such a gritty role and there is no changing minds here – from a personal viewpoint I’d probably would have welcomed a more balanced view on killing people but I liked Kate and her commitment to her vow. The story delves deep into her story and the effects all of this has on her without allowing her to backtrack on her mission. I appreciated all of this very much. Another thing I loved about Vengeance Road: the slow reveals, the secrets behind Kate’s family and ancestry and how the author cleverly connected that with the famous story of the Lost Dutchman’s Gold Mine. Also: the romance. I am a sucker for understated romance especially when boy and girl are on equal footing in terms of agency and decision-making. Finally, it is extremely important to talk about the representation of Native Americans in the novel. And I am of two minds about it. On the one hand, we have the individual portrayal of a young Apache girl called Liluye. Liluye has been separated from her family and with Kate’s help is able to get away and start her own journey back home. Kate and Liluye form an alliance to travel together (safety in numbers) and become allies, if not exactly friends. Liluye is portrayed as equally strong-willed, intelligent, and well-spoken (in fact, her English is better than any other character in the book). She is on equal grounds with Kate and even better: she is one of the few characters who make the right decisions and survive this tale unscathed. Halleluiah. On the other hand, if I appreciated it and believe Liluye’s portrayal to be respectful and well-done, I am not entirely sure about the portrayal of Native Americans as a group. Kate and her white friends always refer to the Apache as violent and brutish and they always express fear of encountering them in their journeys. For most of the book in fact, despite Kate’s best intentions, both her and the boys refuse to call Liluye by her full name – one of the many microaggressions she suffers during their journey. Now, this might “fit” with the internal logic of the novel in which Kate and her friends have all their lives been fed this narrative about Native Americans which they eventually find to have been inaccurate when they meet Liluye’s tribe. And here is where I find myself most conflicted about, because Liluye and her family and friends are presented as the stereotypically noble, mystical, spiritual natives and although this is a more positive portrayal than the violent depiction, this might be in fact, equally harmful. I am no expert though so I highly recommend you follow Debbie Reese’s American Indians in Children’s Literature as she has promised to review this book. Incidentally, her review and thoughts on Rae Carson’s Walk on Earth a Stranger, another recent YA Western, are well worth a read. In the end, I am left with an overall positive impression of Vengeance Road. I love a good western. Ana and I both do–in fact, when we first started The Book Smugglers way back in 2008, Western Appreciation Week was our first ever such event. 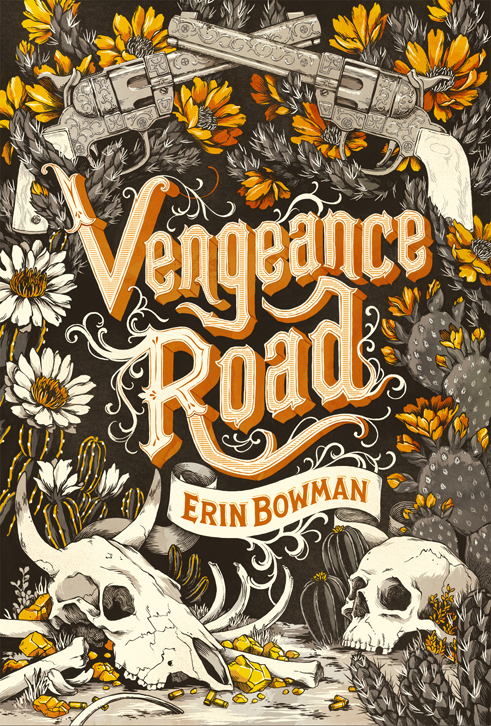 Gritty, dusty, revenge-filled westerns are among my favorites–so reading Vengeance Road by Erin Bowman was an inevitability. And you know what? Bowman delivers on several levels–with one caveat, I thoroughly enjoyed this book. Vengeance Road is essentially True Grit meets gold speculation in sun-scorched Arizona–with a subtle romantic angle to complement its surprisingly high bodycount. Kate, her narrative voice, and her powerful characterization are what make Vengeance Road for me. While the girl runs off, tucks her hair under a hat and pretends to be a boy trope (because DANGER for women on the road) is a well-trodden road in YA-dom, Kate Thompson’s motivations and execution of the masquerade read as genuine and believable. One of the things I found so compelling about Kate’s voice is her razor-sharp focus on revenge and attaining her goal at any cost–and there isn’t any of the eye-roll-inducing cheese or falling head over heels in love at first glance. Kate’s dedicated, tough, and stubborn–most of all she’s angry and remorseless, but we see her character grow from black vengeance to gradual, golden hope. In a lot of ways (minus the lack of fantastical in this book), Kate’s voice reminds me of Saba from Blood Red Road by Moira Young, with the same hunger and rawness and focus. Oh, and Kate delivers, too–in the first chapter, she shoots a man in cold blood, and feels no remorse. Suffice it to say, I’m a big fan of the grit. Similarly, while the plot is fairly predictable and covers many of the types of tropes one might expect–girl traveling as boy, handsome male companions, sidekick-ish female companion made along the way, lots of gunfights, blood, and death–Erin Bowman’s knack for storytelling makes the book utterly enjoyable. The action is taught, the shootouts are plenty and fantastically written, and, most important of all, the setting details are completely immersive. Bowman’s descriptions of the rough road from small homesteads through the desert on the way to the larger towns, like Phoenix or Yuma, are brilliantly detailed from the heat, the dust and the rocky terrain to the dangers one meets on these roads. The only plotting issue I had was with the romance, because why does there always have to be a romance why can’t it just be REVENGE? That said, it’s a personal taste thing, and Bowman’s gradual romance between two main characters is subtle and slow-building instead of the all-consuming passion and looooove that it could have been. Finally, the one big caveat–as Ana mentions in her part of the review, it’s impossible to talk about Vengeance Road without discussion of the portrayal of Native Americans as a whole, and on a smaller scale, Liluye (or, as the others call her, “Lil”). I agree wholeheartedly with Ana’s assessment and conflicted feelings here–there’s the fact that this is historical fiction, and I understand that the attitudes that Erin Bowman is writing for Jesse, Will, and Kate towards “the Indians” is meant to be a product of the time period. Liluye is an intelligent, headstrong young woman on her own quest, and I thoroughly appreciated her portrayal, the tension as she joins Jesse, Will and Kate (especially from the boys), and the narrative strength of Liluye’s voice (and lack of dialect). That said, on the whole, the general portrayal of Native Americans is of the usual stereotypes–ranging from mystical gentle folk of spirit and nature, to the violent savages who thirst for blood, steal women, and cause war. It’s hard not to discuss context when we’re talking about actual people, in the actual past, who have been and continue to be marginalized, especially in fiction and especially by authors who are outside of that marginalized group. I have conflicted feelings, to say the least. And for that, while I thoroughly appreciate Bowman’s writing style and Kate as a narrator, I give Vengeance Road a 6. Holy cow am I excited for this book! I’m weirdly devoted to True Grit, so this title has me giddy. Love getting your two takes on it. Kate sounds like a great heroine, and I can’t wait to take in the writing and storytelling. Thanks for this review. You both articulated a lot of my conflicted feelings about this book in a much better way than I ever could. While I was relieved and happy to see Liluye portrayed positively I was left wondering if there was more that could have been said and I realize now that ties to the portrayals of Native Americans as a group/whole. That said, I still really enjoyed this book and am happy to be seeing more westerns coming out (even if it might be my most problematic genre to love).